Bevan Brothers of Soudley (also known as Soudley Valley Coaches) seem to have had an interesting fleet. 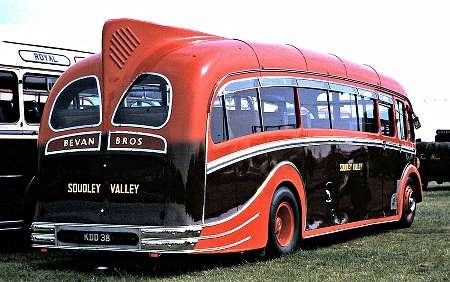 KDD 38 is an AEC Regal III of the 9621A variety and it has Harrington FC33F body, complete with the famous dorsal fin. The first view shows it is passing Hound Church on its way to the Netley rally on 10 July 1988. In the second view, it in the Southsea rally on 8 June 1986. I am sure that this is one of the buses used by Bevans bus company for the school runs to Lydney boys and girls secondary schools. Pupils picked up from the districts of Sedbury Beachley Tutshill and so on. I was picked up in Netherend by the shop opposite our house on the corner. 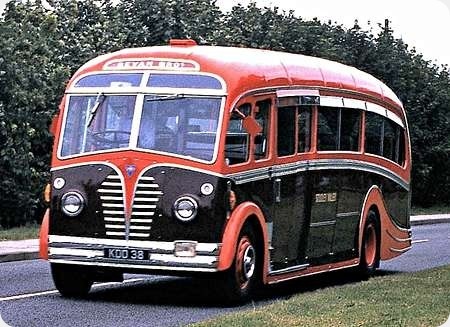 Another of the Bevans fleet I am pretty sure was a Leyland comet. This would have been the 1960`s when I was at school.